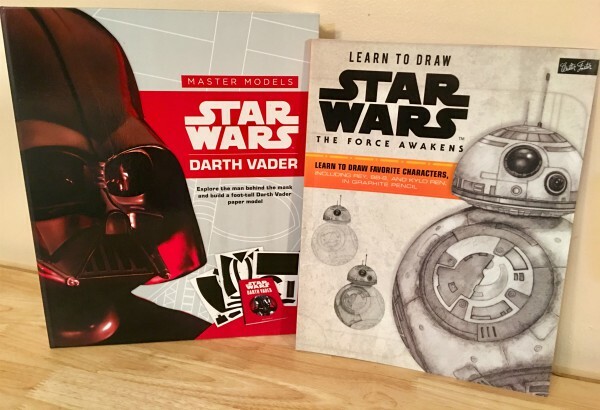 If you or someone you know is a Star Wars fan then you'll definitely want to check out the line of instructional kits and books from Quarto Knows. You can do everything from learning to draw your favorite characters to building a foot-tall Darth Vader model. Now that's something a serious Star Wars fan would dream about am I right? These two are just a small sampling of what's available in the Star Wars line so there's something for every Star Wars loving fan out there for sure! Star Wars Master Models: Darth Vader includes ten sheets of die-cut pieces and an audio component, as well as step-by-step instructions for building the ultimate papercraft bust of Vader himself. The included book, Darth Vader: The Man, The Warrior, The Commander, examines the decision and sacrifices that led Vader from Jedi Padawan to Emperor Palpatine’s second-in-command. Side bars also give a close-up look at the technical details of his life-sustaining suit, his lightsaber, and his TIE fighter. Modelers and Star Wars fans can delve into the galaxy’s greatest villain and delight in constructing a foot-tall bust of the Dark Lord for display. Learn to Draw Star Wars: The Force Awakens brings modern Star Wars iconography to life in stunning graphite pencil, transforming memorable characters including Rey, Poe Dameron, BB-8, and Kylo Ren (along with Leia, Han Solo, and R2-D2) into detailed, realistic portraits. Lucas film collaborator and professional artist Russell Walks guides artists step by step and provides insightful notes, drawing tips, and memorable moments for each character from the film. This book allows readers to develop and strengthen their drawing skills, while experiencing this legendary series in a whole new light. You can find these and other Star Wars titles on the Quarto Knows website.